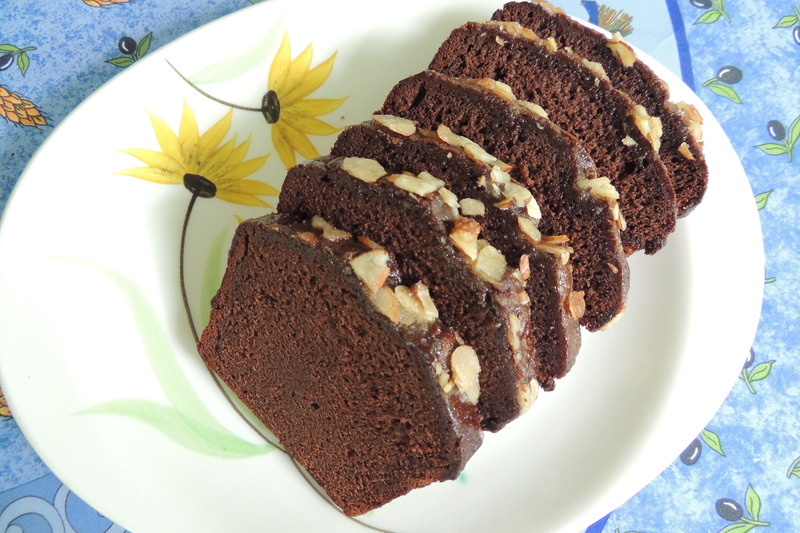 A coffee and chocolate lovers dream, this bread is wonderful for breakfast or for dessert topped with a scoop of chocolate or coffee ice cream. If you don’t have a large, heavy-duty mixer, halve this recipe to make just two loaves. Freezing first and then slicing with a large chef’s knife yields a cleaner slice. The “secret” ingredient is two packages of Starbucks “Via” instant coffee, either regular or decaf; and using buckwheat flour means this is a gluten-free recipe!! Preheat oven to 350 and grease and flour (4) 4X8 loaf pans. Brew five 8 oz cups of strong, hot coffee, either regular or decaf. In large mixer bowl, beat 4 eggs, 4 cups sugar, 1 cup dark brown sugar. Add 2 cups canola oil, beating well. Combine 4 tsp vanilla, 1/4 cup Kalua, and 1/4 cup white vinegar Add to above mixture and blend. In a separate bowl, combine 5 cups buckwheat flour, 1 cup cocoa, 2 tsp baking soda and 1 tsp salt. Add to above mixture alternating with 4 cups of strong, hot coffee. Add two packages of Starbucks “Via” instant coffee. Pour into prepared loaf pans and bake for one hour. Remove from oven and let cool for 10 minutes, then remove from pans onto a cookie sheet and glaze with the following: combine 1 cup sugar with 1/4 cup coffee, 1 tsp almond extract, and 1/2 cup sliced almonds. Spread evenly over four loaves. Cool completely. Enjoy your first slice with the remaining cup of coffee!! Add ingredients in the following order to large mixer while beating on low: 1 egg, 1/3c light brown sugar, 3/4c oil, 2t vanilla, 1T Kahlua, 1T apple cider vinegar, 1/4c unsweetened cocoa, 1/4t salt, 1/2t soda, and 1/8c milled flax seed, 1/2c finely chopped walnuts. Optional: 1/4t cinnamon, 1/4t nutmeg, 1/4c shredded coconut. Beat on high 2-3 min until thick and glossy. Add 3/4c buckwheat flour alternating with 1/2c strong hot coffee plus 1 pkg Starbucks VIA (any kind). Mix until combined. Line a muffin tin with 8 paper liners, add a generous 1/4 cup batter, and sprinkle tops generously with finely chopped walnuts. Bake at 400 about 20 minutes or until walnuts are very lightly toasted.